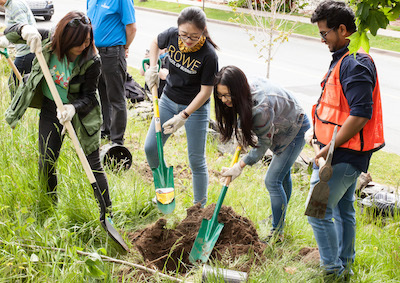 On June 9, a group of 50 Dalhousie students, alumni, faculty and staff and their friends and families grabbed shovels, pickaxes and seedlings and spread out across Dalhousie’s Halifax campuses to create a legacy that will survive long after they've left. 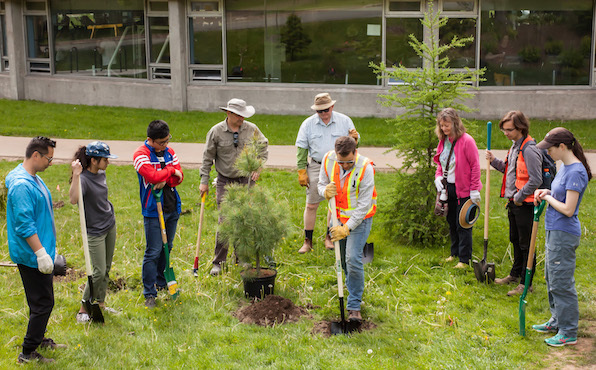 The group kicked off the planting of 200 trees to celebrate Dalhousie's 200th anniversary this year. The project was led by urban forest expert Peter Duinker from the School for Resource and Environmental Studies, who partnered with the Halifax Regional Municipality, Dalhousie Facilities Management and the Dalhousie Office of Sustainability. Students for generations to come will be able to take advantage of the resulting "learning groves": active learning environments where classes can practice identifying native species and observe associations between them. "We want to use these plantings as living laboratories where students and others can learn about the Acadian forest of Nova Scotia without leaving the campus," says Dr. Duinker. Venu Thavarajah, a Master of Resource and Environmental Management student who has been working with Dr. Duinker and the Halifax Regional Municipality on the project, explains that in his class, students spent a lot of time travelling to scattered sites around Halifax to learn about native tree species. With these new learning groves, students will be able to do it within a radius of a few kilometres. He encourages every student to take advantage. "It's not just for environmental studies students. Even for management students, when they go to a firm they'll understand the importance of trees and they will transfer that knowledge to future generations as well." Duinker and his students have been working with Facilities Management since 2017 to identify the tree-planting sites, which were chosen with sightlines and future land use in mind. "We need more trees on this campus," says Dr. Duinker. “We wanted something that future Dalhousians will be able to celebrate at our 300th anniversary, so we selected trees that are expected to do well through a changing climate.” The team also chose species that are resistant to disease and non-invasive. "When we plant native trees it increases the diversity of the ecosystem," explains Thavarajah. "Wildlife, birds and insects will co-evolve with these trees. It will help the microclimate and soil conditions to improve and become more fertile and more productive." In the week leading up to the event, the team prepped the planting sites, marking where each tree would be planted and scalping the surrounding ground (removing the top layer of sod). The day of the planting, student leaders demonstrated techniques and helped to educate the participants while making sure they enjoyed themselves. David Foster, an Interdisciplinary PhD student and leader on the project, has experience running public tree-planting events. He is optimistic about the impact beyond the trees themselves: "One important part of this event is the message. Urban environments are often tough on trees, and achieving the green city we want requires stewardship. Events like this give people the chance to practice this stewardship." Thavarajah was pleased that so many young people were excited to help with the planting. “Hopefully, they’ll come away with a green understanding, and tell their friends." The event will have a ripple effect, with everyone who participated coming away with a new appreciation for what it takes to cultivate a thriving urban forest. See more photos on the DalManagement Facebook page.